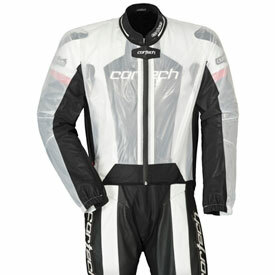 Waterproof, clear Race Rainblocker (RR) material with taped and sealed seams. Stretch panels through the arms, back, shoulder, and sides ensure a snug fit at speed while not limiting flexibility. Bib-style fit with hook and loop panel running through the crotch and attaching to the front of the jacket. Elastic sleeve cuff ensures a snug fit on any size suit sleeve. Back of RR jacket is cut to fit a wide range of speed humps and specifically any Cortech® speed hump.